This campaign is set ten years after a previous set of adventures (HERE). The following is for a brief interim session conducted via video chat. While the rest of the party headed North to Heiping Sect in search of the Phoenix Crown of Bao, Kang Xi and Long Shu traveled on foot north west, first to Purple Cavern Sect then to Red Claw Pagoda. When they first set out, they came upon a blind beggar along the road to Chen. He carried a begging bowl and asked for food. Long Shu shared some food and Kang Xi gave the man some wine. He introduced himself as Begging Dog and agreed to accept their company for the remainder of his journey to the city. A few hours later they passed by two members of Golden Dragon Sect, Golden Snake and Onyx Blade. Long Shu insulted them but they dismissed it and moved along. Further down the road, nearly at Chen, they found a devastated caravan and several bodies. All along the way were broken bits of burned wagon. Dead students from Golden Grotto Academy littered the path but they found one still alive and revived him. He reported that the group had been attacked by members of Golden Dragon Sect who abducted their teacher, Headmaster Mu (see this SESSION REPORT). The student told them that the Golden Dragons had taken Mu south east through the nearby hills. Long Shu asked Begging Dog to take the student to Chen while he and Kang Xi went to investigate. They headed in the direction indicated by the student and eventually reached a small village. When they talked with the headman he seemed nervous and his wife kept looking at a house on the edge of the settlement. Kang Xi approached the house and belittled the Golden Dragon reputation while Long Shu remained hidden near the gate. Eventually a man in golden robes, carrying a hard whip came out and demanded an end to the insults. When Kang Xi continued he attacked. In the confusion Long Shu used Great Stride to reach the house and found Mu inside. Mu helped as Long Shu and Kang Xi attacked the Golden Dragon. He proved tough, but with three men it was possible to take him down. Mu explained that the man they attacked was Master Emerald (the nemesis of Long Shu's Sifu) and that he asked Mu where the Merciless Sunflower Manual was located. He thanked the PCs for their help and he and Long Shu agreed to meet again in Chen to deal with the matter of Lady Tao. Long Shu and Kang Xi bound Master Emerald and took him with them on the remainder of their journey. They had a brief run-in with some local Zun tribesmen, but Long Shu convinced them he was a great martial hero with a fearful reputation, and they fled. Upon their arrival at Purple Cavern Sect, they were brought before Lady Plum Blossom. Long Shu shared what news he had with her. 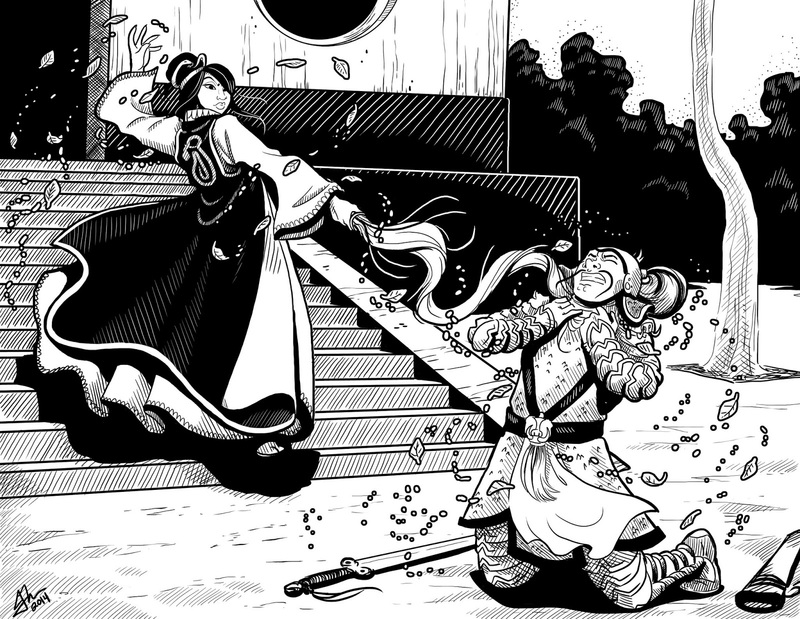 She told him to retrieve the Merciless Sunflower Manual for her if he could and she told him to get rid of the Phoenix Crown of Bao should they find it. When she saw Master Emerald, she stabbed him in the neck and he died. She expressed her thanks to Long Shu by presenting him with an Ox Tail Dao with a turquoise grip. This was the sword of Master Emerald, which she had kept in her possession and now passed to him. They settled any remaining matters and then headed to Red Claw Pagoda.